Billie Eilish, the 17-year-old pop artist from California, kicked off her music career in 2016 with her debut single “Ocean Eyes.” In August of 2017, she released her first EP, “Don’t Smile At Me,” which expanded her repertoire of angsty sad jams. 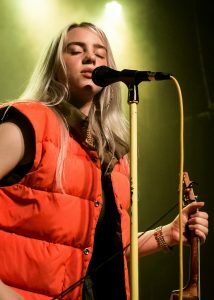 But on March 29, Eilish dropped her second album “WHEN WE FALL ASLEEP, WHERE DO WE ALL GO?” which has generated a lot of mixed reviews, even from fans. The album is definitely on brand with Eilish, and I’m not just talking about her all-lowercase song titles. She experiments with a lot of voiceovers and editing throughout the album, which adds some dimension to the songs, breaking the repetition that many pop artists display when first starting out. Her voice is also breathy as always — I could recognize Eilish’s nostalgic soprano any day. “WHEN WE FALL ASLEEP, WHERE DO WE ALL GO?” showcased Eilish’s reputation as a sadgirl, singing about unrequited love, unrequited love and unrequited love. Dry your tears, sweetie. Some of the songs are great to add to a rainy day playlist, or dare I say, a post-breakup playlist. I recommend “listen before i go,” “i love you” and “when the party’s over” for such collections. However, the room for improvements on this album could fit a small family, quite honestly. Some of the songs are truly good, such as my personal favorite, “when the party’s over,” but it was released before the album even came out. The same can be said about “bury a friend” and “wish you were gay,” which should be called out for its problematic lyricism. In “wish you were gay,” an admittedly catchy song, Eilish laments about a boy she likes, but the feeling is not mutual. Eilish implores “Don’t say I’m not your type / Just say that I’m not your preferred sexual orientation” — but that’s not how it works, silly Billie. “I just kinda wish you were gay,” she repeats over and over. The song is a perfect example of why Eilish has received some criticism. Her lyrics tend to be dramatic, perhaps unnecessarily so, but she conveys struggles with her mental health that should receive empathy and validation. Her most listened to song on Spotify, “idontwannabeyouanymore,” is authentic and heartbreaking, as it exposes Eilish’s insecurities and loneliness — “Don’t be that way / Fall apart twice a day,” she sings to herself. In this album, a similar message is conveyed in “listen before i go,” a slow and melancholy track about Eilish warning her lover about her suicide ideation. “Sorry can’t save me now / Sorry I don’t know how / Sorry there’s no way out (Sorry) / But down,” she sings in her chorus, describing her helplessness. Despite critique Eilish faces for being a dramatic teen, we have to acknowledge that she is a teen, one who got a very early start in a rather unforgiving industry. And she has been creative and honest with her listeners, something we should give her credit for. Perhaps her style will change as she develops as an artist, but it’s a good start. The next time I want to lay in bed for 16 hours, I’m sure I’ll be accompanied by Eilish’s soothing tones.